Booker T. Washington, born into slavery, lived on this tobacco plantation from 1856 until 1865. At this time of year, his suffering was acute. He wore only a flax shirt called a “shirt tail” – basically a burlap sack. No pants. Shoes made with cowhide and wood. The cabin described in his autobiography had holes that let in vermin and cold winter air. Washington was born as chattel – property – a slave. He could not go to school or earn money to buy a winter coat, nor could his mother. 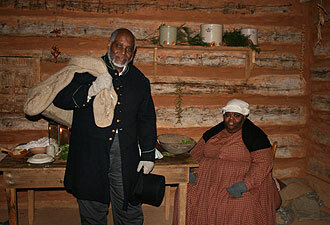 Lacking other necessities as much as he did clothing and shelter, Washington went hungry. His family never really sat down to a meal. He received a cup of milk here and there, and if he “acquired” a potato to roast, he would thoroughly enjoy it. Occasionally he would receive a little molasses on a plate, which he would tilt so that the molasses would spread and appear to be more. At Booker T. Washington National Monument, you'll get a taste of slave life on a mid-19th-century plantation in piedmont Virginia. Begin at the visitor center, where a movie and exhibits help you learn about Dr. Washington's determination, once he was freed, to obtain an education and create a university. This story continues at Tuskegee Institute National Historic Site in Alabama. Follow the Plantation Trail on a ¼-mile loop through the historic area. The trail passes by reconstructions of 19th-century farm buildings like those on the plantation when Washington was a boy. In the farm area, visitors learn about the breeds of animals raised here during Washington's time. 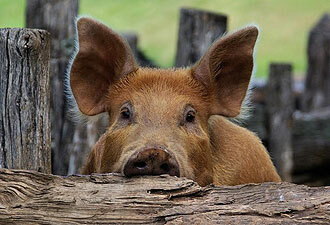 Everyone will enjoy the Tamworth hogs, Cotswold sheep, horses, cows, chickens, turkeys, ducks, and geese. 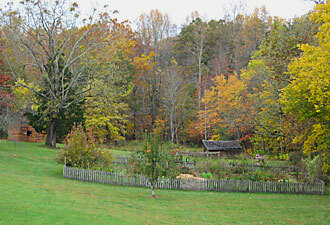 Stop by the garden area to see an example of a typical subsistence garden of 1850s piedmont Virginia. In addition to the Plantation Trail, Booker T. Washington National Monument provides an opportunity for meandering 1½ miles through fields and forests on the Jack-O-Lantern Branch Heritage Trail. Trail guides are available at the visitor center. If you visit now, you might have the park to yourself. Come and enjoy – perhaps during the upcoming holiday weekend on which we honor another great American with “Washington” as a last name. NPS.gov homepage photo: Reconstructions of 19th-century buildings create a sense of time and place at Booker T. Washington National Monument.